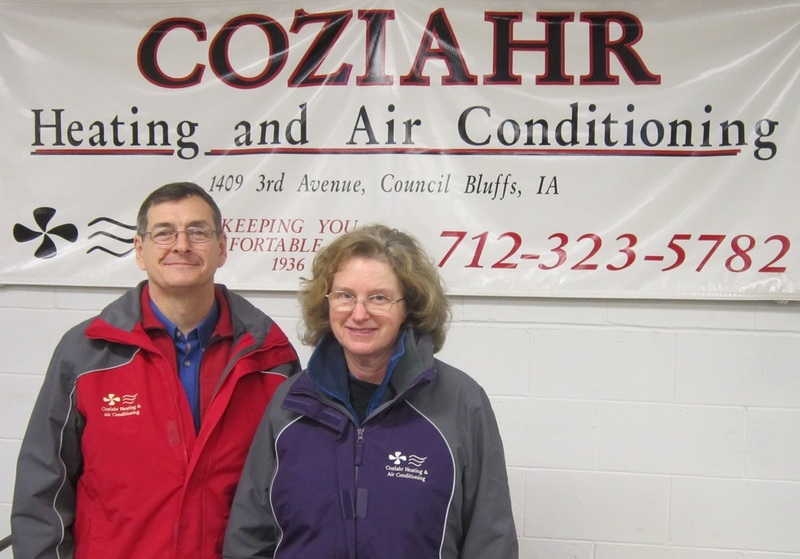 About Coziahr Heating & Air Conditioning, Inc.
Coziahr Heating & Air Conditioning, 1409 Third Ave., offers sales, installation and service of heating and air conditioning systems and components, as well as home energy assessments and radon testing. And they do it all with two employees: owner Dave Coziahr and his wife, Luanne. Many customers begin their relationship with the business when they need a new system. “We have access to all brands, but we primarily sell Luxaire,” Coziahr said. “Our customers are interested in being comfortable and saving energy,” he said. Saving energy on heating and cooling is more complicated than it sounds, Coziahr said. “As an industry, we’re moving toward what’s called ‘home performance,’” he said. This approach recognizes that energy efficiency depends on more than just the heating and cooling equipment itself, Coziahr said. It is affected by the duct system, insulation, windows, seals and more. “We’ve got to look at the house as a system,” he said. Just putting in a high-efficiency furnace won’t make your system efficient, Coziahr said. “If the ductwork is not properly sealed or insulated, you can lose as much as 40 percent of your heat,” he said. Then there’s home insulation, windows and other factors. Coziahr, like utility companies, can do an energy assessment for a homeowner and help them determine what improvements could made and which ones would be the most cost-effective. He can measure the temperature, carbon monoxide and oxygen coming out of the furnace and test the temperature and air flow coming out of the registers to see how much heat and air pressure are being lost in the ducts. Coziahr is a certified Home Energy Rating System rater certified Building Energy Assessment Professional and North American Technician Excellence-certified. Coziahr became a certified radon measurement specialist in 2013 and is in the process of becoming a certified radon mitigation specialist, he said. Radon, a colorless, odorless radioactive gas that occurs naturally, is a widespread problem in the Midwest. “Every home should be tested – especially in Iowa and Nebraska,” he said. Coziahr Heating & Air Conditioning was founded in 1936 by Coziahr’s grandfather, Walt Coziahr Sr.
“My father (Walter Coziahr) grew up in the business no different than me,” he said. Walter Coziahr attended college and then served in the military. He returned in 1959 to work with his father in the family business. Walt Coziahr Sr. died later that year, leaving his son in charge of the business. Dave Coziahr grew up in Council Bluffs and graduated from Thomas Jefferson High School. He earned a bachelor’s degree in construction engineering-mechanical in 1984 and went to work for his dad full time. Luanne Coziahr grew up in Cedar Rapids and graduated from Kennedy High School. She earned a bachelor’s degree in plant pathology and seed and weed science at Iowa State. “In the marching band,” added Luanne.